NEW ORLEANS – All-Americans for the 2018 NCAA Division I Indoor Track & Field season were announced Monday by the U.S. Track & Field and Cross Country Coaches Association (USTFCCCA). 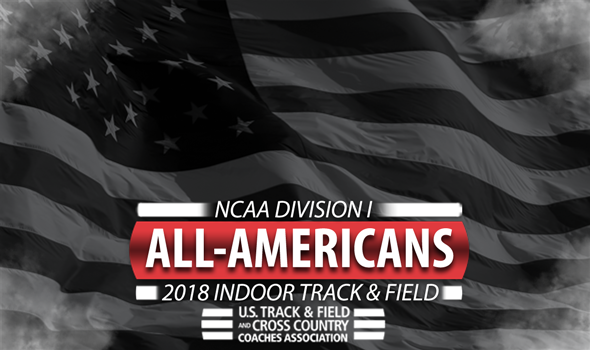 Athletes of member institutions who finished in the top-8 of their respective individual events and relays at the 2018 NCAA Division I Indoor Track & Field Championships this past weekend took home First-Team All-American honors, while those who placed ninth through 16th were named Second-Team All-Americans. The remaining athletes were bestowed with Honorable Mention. The Florida men and Georgia women captured their respective gender’s team titles. For the Gators, it was their first indoor title since 2012, while the Bulldogs won their first track & field championship in program history. Georgia was one of five teams with double-digit First-Team All-Americans. The Bulldogs tallied 10, as did the women from Kentucky, LSU, Oregon and Stanford. No men’s team earned more than nine First-Team All-Americans. Florida and Georgia tied atop the heap with nine, while Southern California, Texas A&M and Virginia Tech each had eight. Only three athletes landed three First-Team All-American nods: Florida’s Grant Holloway (60 hurdles, long jump, 4×400 relay) and the Kentucky duo of Jasmine Camacho-Quinn (60 hurdles, 200 and 4×400) and Sydney McLaughlin (200, 400, 4×400 relay). No team had more overall All-Americans than the Ducks. Oregon athletes combined for 27 All-American honors – First-Team and Second-Team included. Arkansas and Southern California finished in a tie for second with 24. No conference had more overall All-Americans than the SEC, which nabbed 181 honors. The MPSF was a distant second with 104, followed by the Big Ten (92), Big 12 (81) and the ACC (79). See below for a full list of NCAA Division I Indoor Track & Field All-Americans.